It’s fall time. Everything says it. The weather has finally turned. Leaves are red and gold on deciduous bushes and trees. Nights are cool, most days too. The calendar tells us that we are now well past the Fall Equinox. Ok, so the evidence is in. It’s fall. Can anyone disagree? Why even ask that question? Because in a recent “public information” piece, Portland General Electric (PGE) states that cold water needs to be held back in Lake Billy Chinook during hot summer months, and to not do so “could create worse conditions for fish later in the year.” Based on presentations and publications by PGE that we’ve seen, “later in the year” means the fall. It implies the cold water is needed for arriving Fall Chinook, who begin to spawn within a short period of time after arriving in the lower Deschutes River. The Fall Chinook, true to their name, are now in the lower Deschutes River. So where is that cold water that PGE needed to hold on to last summer when it could have been used to cool an overly warm lower Deschutes? Apparently still in Lake Billy Chinook. 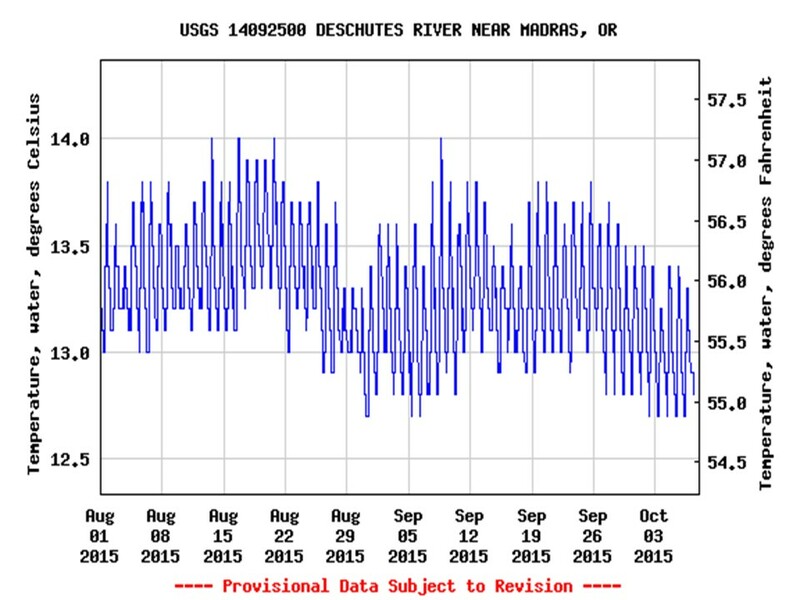 Water temperatures at Madras gage, August-September, 2015. Source: USGS online. 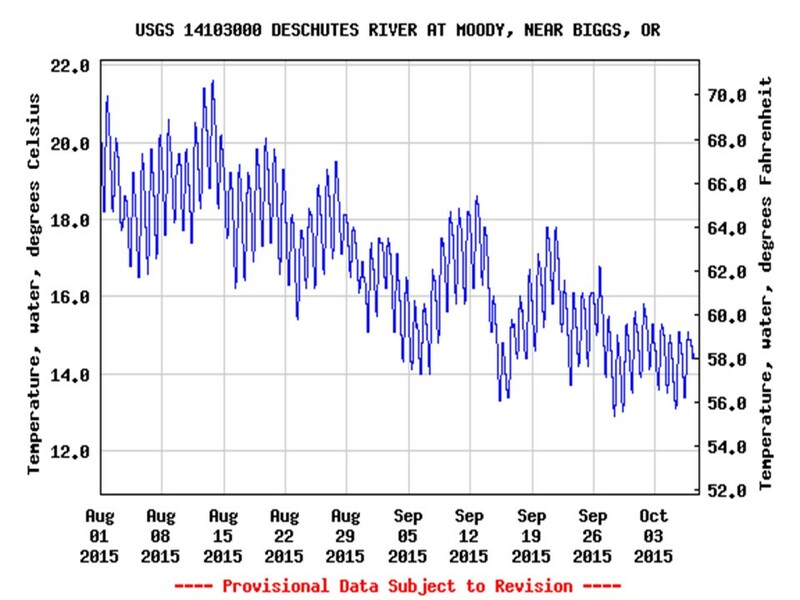 Water temperatures at Moody gage, August-September 2015. Source: USGS online. What you are seeing is nearly a ten-degree drop in temperature since August 1. That would be fairly typical fall time cooling, despite it being a warmer than usual fall. So adding any cold water from the reservoir now is (dare we say this?) redundant. We are grateful that PGE gives Fall Chinook spawning such a high priority. We wish they’d do the same with native redband trout spawning. Over the course of the past two years, PGE has engaged in rolling back the legally defined timeframe for cold-water fish spawning and incubation in the lower Deschutes. Until recently, that period was defined as being from October 15 until August 1 of each year. 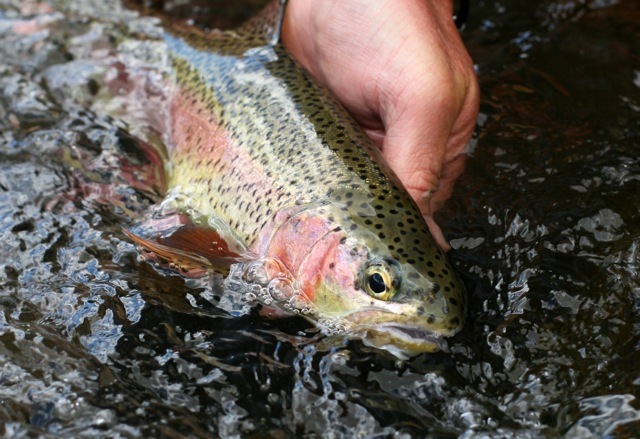 That period encompasses spawning times for all cold-water fish species in the lower river. 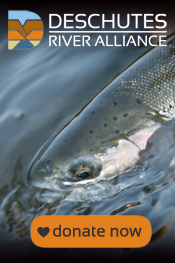 The defined spawning and incubation period also carries legal requirements under Oregon Administrative Rules for minimums for dissolved oxygen and maximum limits for water temperature. 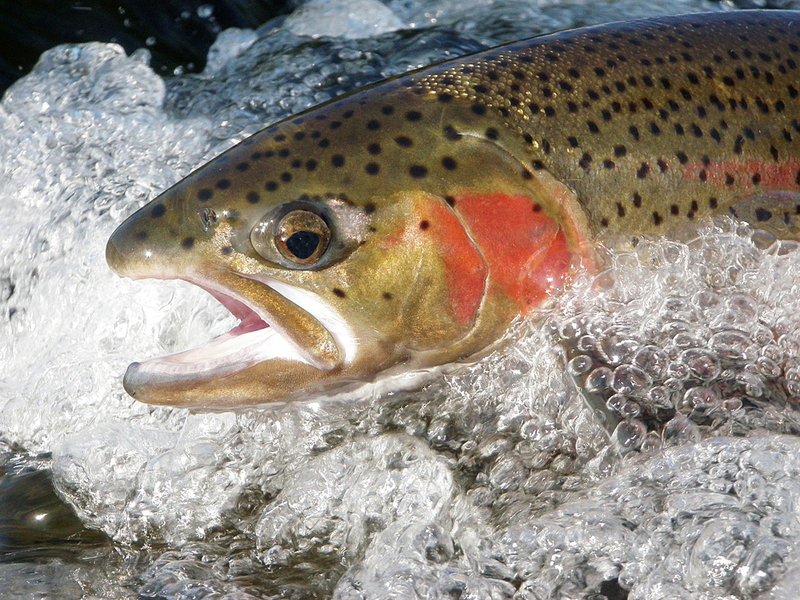 PGE has been engaging with the Oregon Department of Environmental Quality in a systematic fashion, out of public view, to roll back the end point of the defined spawning time from August 1 to June 15 (and yes, we have solid evidence of that). So now, between June 15 and August 1 of each year, water discharged from the dam complex can be warmer and have lower oxygen levels than prior to the change. This photo was taken on July 30, 2015. It is obviously a fresh redd, and is undoubtedly a redband trout red. 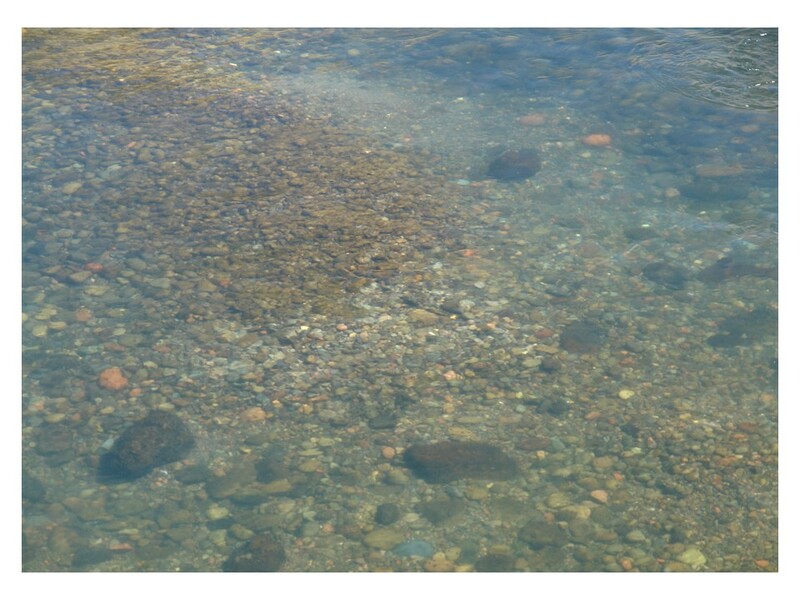 This unaltered photo was taken in the lower Deschutes River below the dam complex. No spawning after June 15? Say what? Apparently the fish did not get the memo explaining that spawning and incubation now ends on June 15. Why would PGE want to roll back the spawning period definition? To make dam operations have less impact on the lower Deschutes? Apparently not. The problem at the dams is that the warmer the water is, the harder it is to maintain adequate levels of dissolved oxygen. But why change operations when you can change the rules? Fair enough. The problem is that the sun doesn’t shine 24 hours a day. The ambient canyon conditions are not the same throughout a 24-hour period. We were recently, while analyzing thermal imaging data, able to track flows discharged from the dam complex during low light and darkness for up to 90 miles downstream. The length of river cooled during those low light or nighttime flows can make up nearly the entire length of the lower river. When fish are dying in the lower river, whether those fish are from the lower Deschutes or not, it’s time to not just facilitate “slight” water temperature reductions, but drop the temperatures as much as possible. During the summer, the water at the bottom of Lake Billy Chinook is twenty degrees cooler than the surface water being used at the Tower; so much cooler water is available to discharge into the lower river. Do we really want more heat related fish die-offs? Or is it really better to save the cold water for fall time? An article just appeared in The Drake magazine by Steve Hawley, author of the book, Saving a Lost River. In the article he describes the bottom draw operation at Round Butte Dam that existed prior to construction of the Selective Water Withdrawal Tower as an “unnatural act, but one that anglers around the world came to appreciate.” Yes we did.